Seahawks coach Pete Carroll was fined $10,000 for walking onto the field during the final minute of a loss Sunday at Jacksonville. 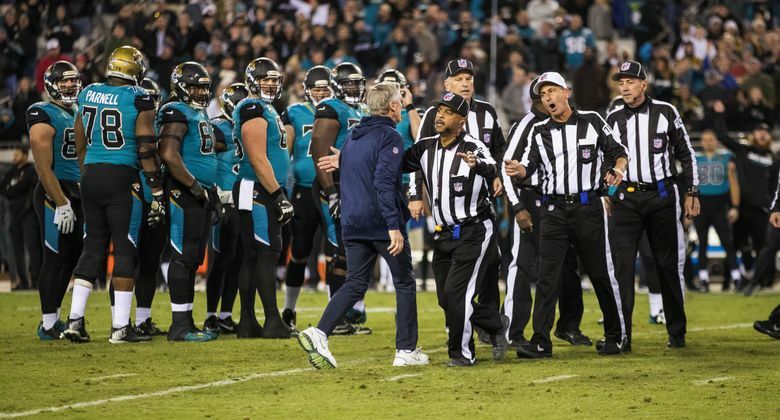 Pete Carroll knew a fine was coming the minute he walked on to the field at Jacksonville in the late going of Sunday’s 30-24 loss to the Jaguars. Germain Ifedi still has no idea why he got a penalty, let alone a fine. And if anyone on the outside was surprised that Michael Bennett did not get a fine, the Seahawks were not. As expected, the Seahawks got hit hard in the pocketbook by the NFL when fines were revealed Friday for the chaotic events at of the Jaguars game. Carroll and three Seahawks players were docked a combined $52,539 by the NFL for varying penalties. Carroll was fined $10,000 for walking onto the field while Ifedi, Seattle’s right tackle, was fined $24,309 for what was termed as “verbal abuse of a ref” for a penalty he drew in the first quarter. Defensive linemen Quinton Jefferson and Sheldon Richardson were each fined $9,115 for the unnecessary roughness penalties they drew that got them ejected in the final minute, and Jacksonville running back Leonard Fournette was also fined $12,154. The NFL did not fine Bennett — who attempted to swipe the ball while the Jaguars were in kneel-down mode to run out the clock and dived at center Brandon Linder — who sparked the tussles that led to the incidents involving Carroll, Richardson and Jefferson. Carroll said that Bennett not getting fined was what he expected. As for Carroll, he said he knew the minute he walked on the field to try to calm things down that he’d get a penalty, and he also knew that, at that point, the game was over and getting a penalty didn’t matter. “This time of year, giving is everything,” Carroll said. Jaguars offensive line coach Pat Flaherty and wide receiver coach Keenan McCardell also were fined $10,000 for the same offense. Ifedi was fined for what was termed as verbal abuse of an official. On the play, which occurred in the first quarter, Ifedi was called for holding. But a pass-interference penalty on the Jaguars negated the penalty. Ifedi then drew a flag for taunting. Ifedi said Friday he had “no idea” what he said to draw the flag, and that the officials did not tell him anything. As for the fine, he said he had “no comment” and didn’t know if he would try to appeal but would look into that next week (Ifedi got a hefty penalty because it was deemed to be a second offense). The penalty was one of four Ifedi drew in the game (though only two were enforced) and he has an NFL-high 17 for the season (as well as an NFL-high 13 that have been enforced). Carroll noted that the Jags were twice called for illegal hands to the face against Ifedi. Ifedi downplayed that the game was any different from any other. Carroll and offensive line coach Tom Cable each said this week that players can earn reputations for penalties, suggesting that opponents can try to goad players into getting them and that officials can pay more attention to players they know get a lot of flags.